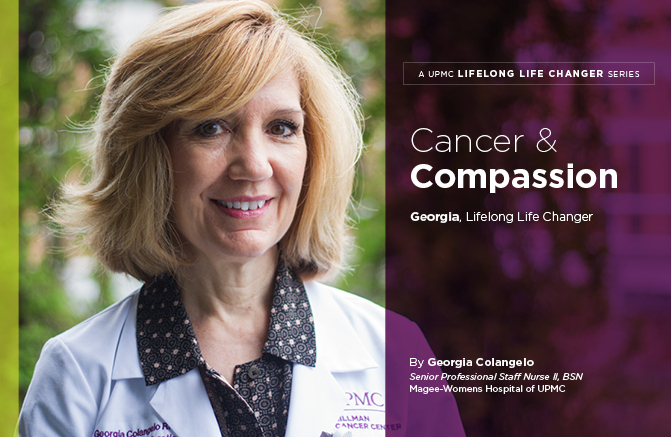 My name is Georgia Colangelo, and I’m a UPMC Lifelong Life Changer. My story begins 36 years ago, in 1982, when I was selected to work during the summer as a nurse intern in the Oncology Unit at UPMC Presbyterian. I was excited to learn, but skeptical that I would enjoy oncology. But after a summer of being mentored by a highly respected group of nurses, I was hooked! In 1983, I came under the leadership of Kathy Hays. She had her work cut out for her training seven new nursing graduates on the skills and insight it takes to work in oncology. I quickly learned to mix and administer chemotherapy, but I also had other lessons to learn. I had to learn what it means to earn the trust and respect of my patients and how to deal with stress and loss. My peers were supportive and inspiring, and I formed friendships with several who have become lifelong friends. I have worked in oncology ever since and am proud to have been one of the first nurses to work at the Pittsburgh Cancer Institute, now known as the UPMC Hillman Cancer Center. It has been amazing to see the program evolve and get to work with these highly respected physicians. I like to share with patients the progress I have seen in cancer care and hope that it offers them hope. Working for UPMC has challenged me professionally and given me the opportunity to care for people from all walks of life and transition through different phases of adulthood. I was fortunate to meet my husband at UPMC and also change my hours to work part time while raising my daughters. As a long-time employee, I also benefited from tuition assistance while my daughters were in college. I, too, was comforted by UPMC staff when my parents were patients. Now as a senior nurse I am inspired daily by the younger nurses who are caring, well-educated, and eager to make a difference with their patients. In some ways not much has changed in my 36 years at UPMC!